Searching for the world's newest blood-diamond bazaar, I arrive in Manica, Mozambique, near the border with Zimbabwe. It's a sunny provincial town of shady bungalows and bright purple bougainvillea set around a central square. Just off it, in the downstairs bar of a small hotel, I ask the waiter about diamonds. He makes a call, and a tall man in a double-breasted jacket appears and introduces himself as Francisco. Francisco leads me to a storeroom at the back of the hotel and shows me a small pile of glassy brown and pink pebbles in a piece of folded newspaper. He recounts how three years ago, as Zimbabwe's economy collapsed in hyperinflation, the citizens of Mutare  in the east of the country, just 12 miles (20 km) from Manica, across the border  discovered billions of dollars' worth of diamonds under their feet. Most countries deem it illegal to trade in rough diamonds without some sort of certification, but those rules are easily circumvented in a sleepy rural town in western Mozambique. Rough stones began showing up in Manica, says Francisco. And as the reputation of the Marange diamond fields in Mutare grew, illicit buyers began arriving from around the world. They in turn attracted more smugglers, not just from Zimbabwe but also from diamond fields in Botswana, Namibia, Angola, the Democratic Republic of Congo, even Guinea-Conakry in West Africa. 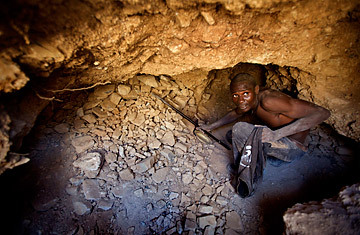 In months, little Manica (population perhaps 20,000) became a global hub for illegal diamonds. A whole new economy sprang up. Scores of the town's pretty Portuguese bungalows were repainted, fitted with satellite dishes and rented to gem dealers from South Africa, Lebanon and West Africa, who roared around in 4×4s. Francisco wants to set me up too: "An office, some place to put all your equipment, licenses, security. You just bring the investment." He walks me to a turquoise-and-white bungalow where he installed a Lebanese dealer two years ago. Ali (he didn't give his full name) is in his 50s, unshaven and wearing a tracksuit. Behind lace curtains in his front room, he explains that dealers like him act as quality control for the illegal trade. They inspect and value stones. Then they buy the ones they like and sell them to secondary buyers who fly in from the U.S., Europe, Israel, Lebanon and India. These second-tier dealers smuggle the diamonds to polishers in their home countries, where the rough stones are cut, mixed with legitimate gems and sold to high-end jewelers. In 2009, the diamond-industry analyst Tacy valued global annual production at $8.46 billion and retail sales at $58.7 billion. The Zimbabwean government reckons Marange's production could reach $1.7 billion a year  no less than a fifth of the world's diamond output and the sort of money that could prop up Zimbabwe's aging dictator, Robert Mugabe. With the state down to its last few million dollars in early 2009, Mugabe agreed to end 29 years of one-party rule and share power with the opposition Movement for Democratic Change (MDC). Poverty was the opposition's leverage. But an influx of diamond cash before a new constitution is agreed to "has the potential to change those dynamics at a stroke," says a senior MDC leader in Harare, the capital. Certainly, after several public displays of unity with MDC leader Morgan Tsvangirai, Mugabe has suddenly reverted to form. After stringing out negotiations over sharing power and the new constitution for more than a year, on Oct. 15 he announced he wanted all talks over by next February and a fresh election by midyear. He no longer had any need for Tsvangirai, he said, adding, "Some of the things that Tsvangirai does are stupid and foolish. That's why we need to have elections to end this inclusive government." The prospect that diamonds might cement one of the world's most notorious tyrants in his fourth decade in power only underlines the weaknesses of the diamond trade's regulatory body, the Kimberley Process. As delegates from industry, government and rights groups assembled in Jerusalem on Nov. 1 for Kimberley's annual plenary session, they faced an agenda of one item  Zimbabwe  and two questions: How badly has Zimbabwe damaged Kimberley and the diamond trade? And can anything be done about it? Download TIME's iPhone, BlackBerry and Android applications.